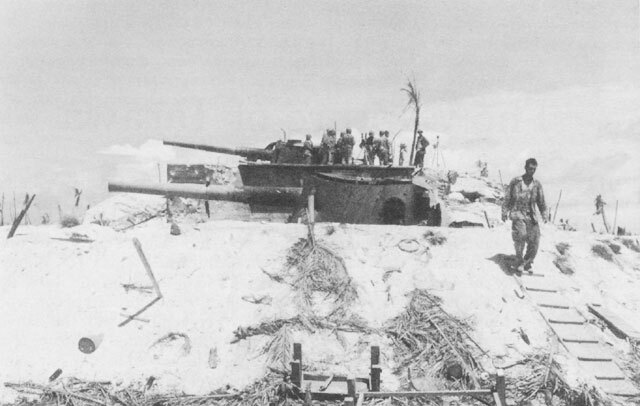 Japanese Naval Guns Emplaced on Betio. These 8-inch (200-mm.) guns were part of the fortifications installed on teh island. Even this much of a delay proved overly optimistic. In fact, the first amphibian tractor to touch the beach did not arrive until 0910. Although the mine sweeper Pursuit and one observation plane had already reported that 0900 was too early by at least fifteen minutes to expect the first touchdown, Admiral Hill nevertheless ordered all naval gunfire, except for that of two destroyers, to cease by 0855. Western End of Betio After Bombardment. Open area in right center is the end of the airstrip runway. RED Beach 1 is shown in upper right. Note coastal fortifications in foreground. However, even this destruction was not enough. Along the beaches there were many pillboxes of concrete, coconut logs, and steel, most of which were not destroyed.22 On RED Beaches 2 and 3 there were at least five machine guns manned and firing at the troops as they advanced over the reef toward the shore. As Admiral Hill put it, "that was five too many. "23 To the marines who led the assault on Betio without any armor heavier than their helmets and the shirts on their backs, this was a gross understatement. RED Beach 1 presented the only irregular shore line on Betio Island, a deep cove indenting the island just east of its western tip. The boundary between the zone of action of the 3d Battalion and the 2d Battalion, 2d Marines, just east of it, lay almost at the point where the shore line straightened out to sweep in a fairly regular line toward the island tail. All along the reaches of RED Beach 1 lay a coconut log barricade, erected as an obstacle over which invading troops must crawl. The barricade was separated from the water on the western half of the beach by approximately twenty yards of coral sand. On the east the beach was much narrower, and in most places the water lapped at the base of the logs. High tide would cover all of the beach strip within the cove. 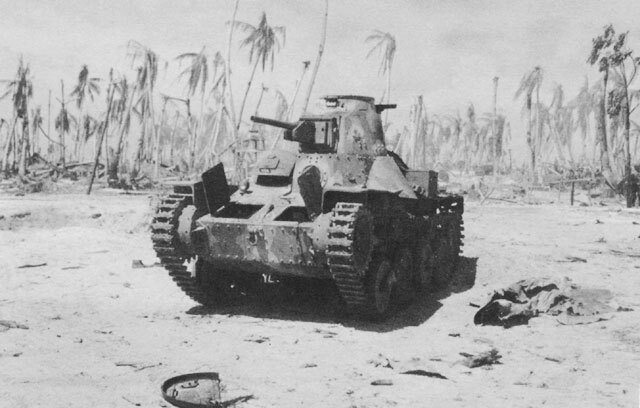 The amphibian tractors of the 3d Battalion were the first by two or three minutes to land on Betio Island. As they reached the reef and clambered over it they met heavy fire from machine guns and antiboat weapons. The LVT's had been under scattered fire since leaving the line of departure, but the volume that fell upon the tractors as they waddled over the reef toward the beach was so heavy that it caused considerable disorganization in the three waves. The principal source of enemy fire seemed to be one large emplacement at the left extremity of RED Beach 1, between it and RED Beach 2. The Japanese here were in a position to rake the entire approach formation. By the time the initial wave climbed out of the water at 0910, casualties in Company K were already so great as to make it extremely doubtful whether that unit could establish a foothold on the shore. RED Beach 1. 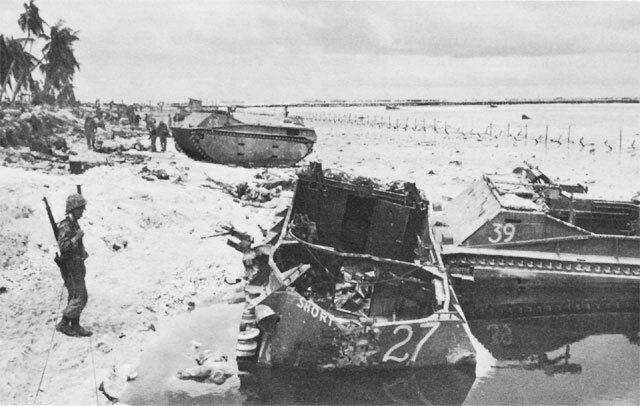 Damaged LVT's and floating bodies testify to the ferocity of Japanese resistance at the junction of RED Beaches 1 and 2. In Company I, which was farther away from the troublesome strong point, casualties were less heavy at the outset, though by 1100 both companies had sustained 50 percent casualties.25 The movement toward the island had been steady. Here and there, a tractor, hit and burning, was stopped dead in the water. If its occupants were alive and able to do so, they climbed over the sides and tried to wade ashore. From those vehicles that pulled up before the log barricade, the marines jumped to seek whatever cover the barricade afforded. Company K found itself under heavy machine gun fire from the strong position on its left and the bullets sweeping up the narrow sand shelf kept the men's heads to the ground and forbade movement. Company I found the barricade offered some protection from the fire. Within a few minutes, the riflemen of this company began to infiltrate inland. As already indicated, during movement of the 3d Battalion toward the beaches LVT's had been hit and were either destroyed or burning. As the fourth wave, including some tanks, approached the beach, the men could see, ahead of them through the smoke and dust from the island, the disabled vehicles. in search of another more favorable landing site. The command boat came up just as the LCM's were turning, and Major Schoettel immediately ordered them to the beach.26 Company L, under the command of Maj. Michael P. Ryan, arrived at the reef at this critical moment and the company commander ordered his men into the water to wade ashore. On the beach most of Company K and part of Company I were drawn up before the log barricade. To the left of RED Beach 1 the formidable emplacement at the battalion boundary had a clear field of fire all along the narrow strip of sand between the water and the sea wall. 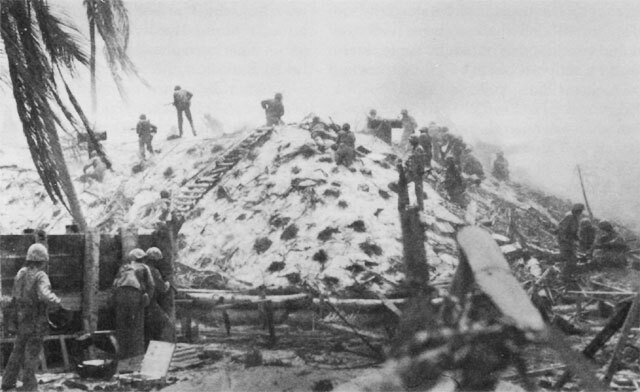 Company K, which had already suffered heavily during the landing, now had to lie in the exposed area under constant fire, incurring further casualties. Company I, which had had fewer losses during the ship-to-shore movement and on the beach, had pushed inland for fifty yards. Until 1100 there was little if any communication between the two assault companies. Company K, after being pinned down to the narrow sand beach, had finally managed to push a few men over the coconut barrier and to a point fifty yards inland from the shore, about the same distance as that reached by the unit on the right. The platoon of medium tanks attached to the 3d Battalion had been ordered by Major Schoettel to debark and the tanks were put into the water at the reef line, about 1,200 yards from dry land, while Company L was still struggling through the water toward shore. In front of them went the tank reconnaissance men to place guide flags in the potholes offshore. Disabled LVT in the water at the junction of RED Beaches 1 and 2. Note shattered M1 rifle on the deck and tank turret showing above the water off the stern of the LVT. note half-submerged tanks in center background. had been constructed to form a sea wall. For the most part the barricade lay about twenty yards from the water's edge, thus leaving a narrow open strip of deep coral sand over which the marines would have to move after leaving the water. The enemy had constructed pillboxes and shelters along the barricade at intervals, and the defenders in these positions could keep the narrow sand strip and its approaches under heavy fire. As the three original landing waves headed for RED Beach 2 they were subjected to heavy concentrated fire from all along the beach, the heaviest coming from the same positions on the boundary that were causing the 3d Battalion so much trouble on the right. There was no possibility of sideslipping out of range of the enemy's guns, although troops that were not mounted on LVT's could find some protection by wading ashore under Central Pier. As soon as the first LVT's climbed over the reef on their way to shore, the scene in the 2d Battalion zone became one of almost indescribable confusion. LVT's were hit by all types of gunfire. Some of them were disabled and lay helpless in the water. Crews and assault troops climbed over the side and waded toward shore. When their vehicles were hit, the drivers of some LVT's lost control and veered off course. Others, seeking vainly to escape the direct frontal fire, eventually landed on RED Beach 1. Even before the first waves had landed on RED Beach 2, reserve elements coming to the reef in LCVP's found that there was not enough water to float the small craft over the shelf. The men in the boats without hesitation leaped into the water for the long trek to shore. of the troops on RED Beach 2 may be seen from the composition of Company F in the late afternoon. At that time the company commander had under his control six men from Company F, sixteen from Company E, ten from Company C, and fifteen from Company H.
The 2d Battalion lost its commander, Lt. Col. Herbert R. Amey, during the landing. Approaching the reef in an LCM in the fourth wave, which included half of the battalion headquarters group and a few observers, and discovering that there was not enough water to float the lighter beyond that point, Colonel Amey hailed two passing LVT's on their return from the beach. The headquarters group scrambled into the tracked vehicles and started toward shore. While still 200 yards from land, the tractor containing Colonel Amey was stopped by barbed wire. Rather than spend time circling to look for a passage the battalion commander ordered his men over the side to wade ashore. As the group waded toward the barbed wire, a burst of machine gun fire killed Colonel Amey and wounded three others. The remainder of the headquarters immediately splashed to cover behind an abandoned boat. Since Maj. Howard J. Rice, the battalion executive, had landed on RED Beach 1, Lt. Col. Walter I. Jordan, an observer from the 4th Marine Division, assumed command of the 2d Battalion until Major Rice could rejoin his men. The command post was eventually set up in a shell hole in the middle of RED Beach 2. Salt water or enemy machine gun fire had rendered the battalion's radios useless, and communication with the widely scattered elements, except by runner, was impossible. It was not until well after 1000 that a runner system began functioning on RED Beach 2. Even then, no attempt could be made to expand the area seized by the first landing waves. Each of the companies and the command post group had to give full attention to survival. Huddled along the coconut log barrier, moving only when necessary, the battalion turned its efforts to eliminating the enemy positions that jutted out onto the beach itself. Groups from the 18th Marines (Engineers) that had landed with the first waves moved up and down the narrow beach area blowing up dugouts and emplacements with demolitions. Behind the battalion the water was filled with amphibian tractors and debris. Troops still struggled to get ashore, some wading, others approaching gingerly in commandeered landing tractors. Practically all the marines who came ashore in this area had chosen the relative shelter of Long Pier and were trying to push toward the beaches by threading their way along the piling. by one platoon of Company G. One reason that this landing was considerably more successful than the others was the longer period of naval bombardment before the landing. The fire from the two destroyers in the Red Beach 3 area lasted until seven minutes before the first LVT reached shore. Although heavy fire of all types greeted the first waves, it was not as effective as that on the other beaches. 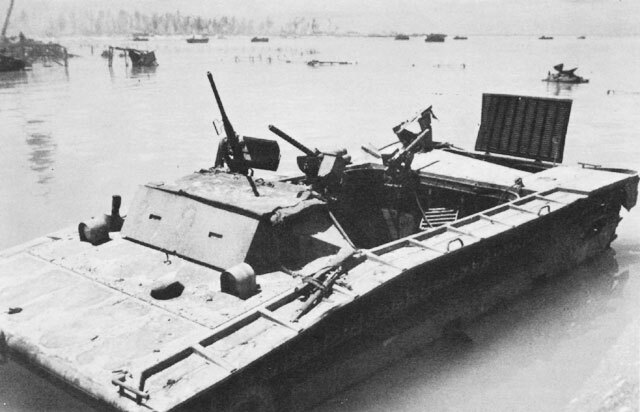 One LVT received a direct hit and was stopped in the water, and a few casualties were inflicted on other landing craft. The number of men lost in the battalion totaled under twenty-five. Five of these casualties, officers of Company E, were hit as they debarked from their respective landing craft on the beach next to Central Pier. Colonel Shoup had maintained constant radio communication with all three of his landing team commanders until Colonel Amey was killed. Shoup later regained contact with Colonel Jordan through the radio of the 2d Battalion, 8th Marines. Information from RED Beach 1 was scanty, owing to the failure of Major Schoettel to get ashore. RED Beach 3. 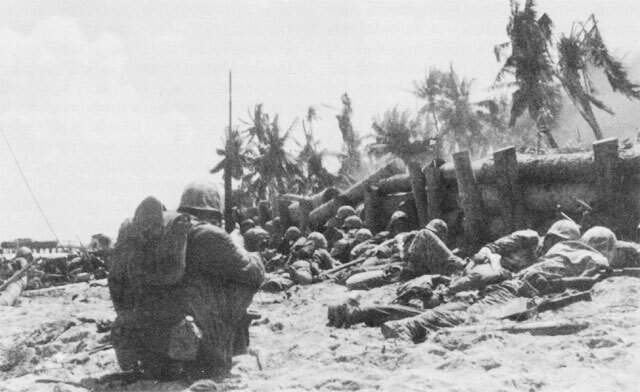 Marines take cover behind the sea wall on the beach (above). A medium tank supports the attack, Burns-Philip Wharf in the background (below). Major Kyle moved at once to the reef but found, as others had before him, that the landing craft in which he was boated could not negotiate the shallow water between there and shore. By this time, approximately 1030, more LVT's from the original landing waves were returning to the reef line. Major Kyle set about at once to secure as many of these as possible. At 1100 he had commandeered enough of them to boat Companies A and B. Company C remained at the reef until additional vehicles could be procured and did not land until after 1300.40 Meanwhile, during the transfer of the two assault companies of the battalion, enemy fire had continued heavy throughout the lagoon. Three of the 1st Battalion's boats were sunk by direct hits during the debarkation. When the LVT's turned and started again for the beach they were met by the same intense fire that had greeted the units landing earlier. In the ensuing twenty minutes many of the tractors received hits from large-caliber shells or were riddled with bullets. As in the case of the early assault waves, many marines were forced to take to the water and wade ashore with resultant heavy casualties. The tractors on the right were forced off course. A total of one officer and 110 men thus landed on RED Beach 1 and eventually joined the 2d and 3d Battalions. By early afternoon of D Day five battalions of marines had been committed at Tarawa. All but one had sustained heavy casualties and were in a badly disorganized state. On RED Beach 1 elements of three battalions supported by two medium tanks were fighting virtually separate actions. On RED Beach 2 elements of two battalions struggled to hold the ground they had seized in the landings and fought to clear out the positions from which fire was being placed on the narrow beach area. Some attempt was made to expand the beachhead, but with little success. On RED Beach 3 the early successes of Company E, 8th Marines, were consolidated, and the major effort was directed toward the reduction of the troublesome enemy positions near Burns-Philp Wharf. 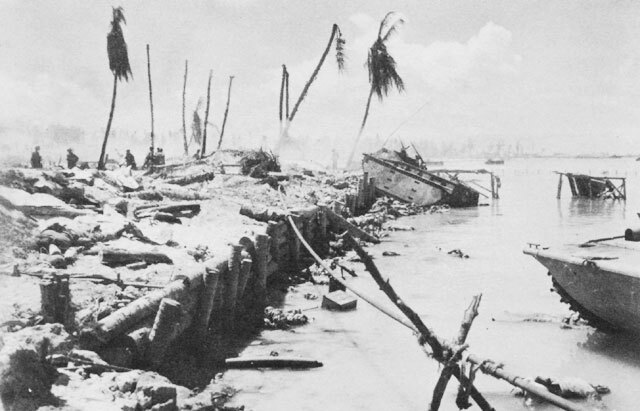 Major Ryan's reports of the conditions on RED Beach 1 failed to reach their destination, and the suitability of Green Beach for landings was not yet realized. Neither General Julian Smith nor Colonel Shoup was optimistic about the situation on RED Beach 1. Both officers, who had received their information during the morning from reports of Major Schoettel, were under the impression that the position of the 3d Battalion, 2d Marines, was extremely tenuous.44 It was only at 1800, when Colonel Shoup finally succeeded in establishing radio contact with Major Ryan, that the real situation became known. Major Ryan, in the meantime, had withdrawn his lines into a more compact defensive position and reported that the 3d Battalion held a beachhead approximately 300 yards deep and 150 yards wide. 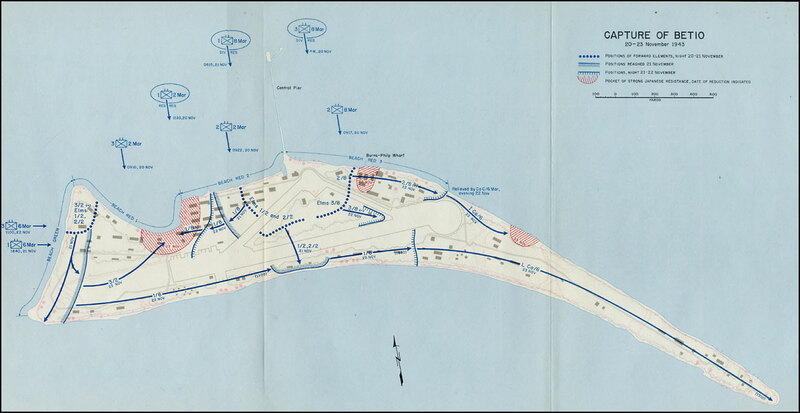 On the right of Major Crowe's line, Companies E and G, supported and reinforced by elements of the 3d Battalion, 8th Marines, consolidated their hold on the area between the beach and the airstrip triangle. The advanced positions, however, were under constant rifle and machine gun fire from bypassed Japanese defenders who had utilized every conceivable hiding place from which to harass the invaders. Original supply plans of the 2d Division had called for a routine discharge of cargo from the transports into available lighterage following debarkation of assault troops. managed to get three vehicles ashore on RED Beach 2. These were eventually ordered by Colonel Shoup to move across the front to support the 3d Battalion, 2d Marines, on RED Beach 1. 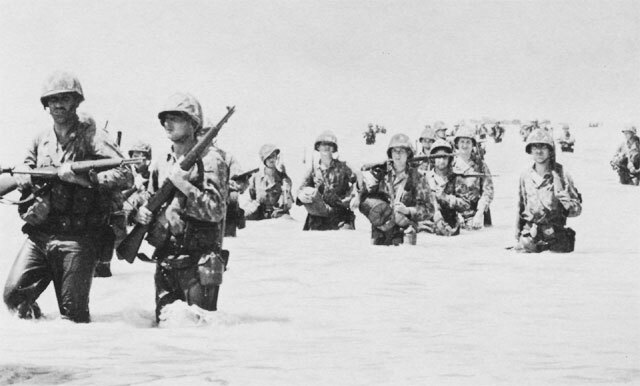 As they approached the formidable Japanese position between RED Beach 1 and RED Beach 2, however, they were halted by marines who told them they could not get through. 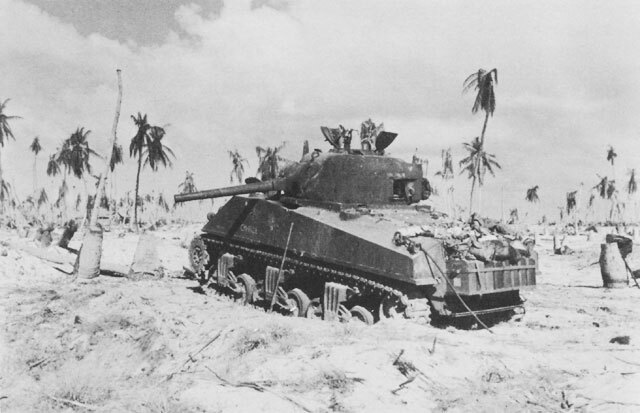 The tanks were eventually put to work by the 2d Battalion, 2d Marines, and aided materially in eliminating several of the pillboxes and reinforced emplacements behind RED Beach 2. Two of the three vehicles were put out of action during the first day. As night fell on Betio, the 2d Division faced its most critical period--everyone expected the Japanese to counterattack. At every point on the beachhead the hold was precarious. At 1911 General Smith had radioed Colonel Shoup, "Hold what you have. "60 Efforts to expand the beachhead were to be discontinued until morning. Under cover of darkness, however, the task of resupply and reinforcement was to proceed. Coincident with the attempt to bolster the men ashore with reinforcements, was the effort to straighten out the supply situation. The key to this seemed to lie in the assembly of landing craft and amphibian tractors that had been near the line of departure throughout most of the first night. Beach Defensive Positions, which had to be eliminated by small unit action. Note wire beach obstacles in left background. The attack of 22 November was to have two objectives. The first was to advance to the east along the south shore of the island. This movement was to be made by the 1st Battalion, 6th Marines, attacking from Green Beach through the lines then held by the 3d Battalion, 2d Marines. The advance was to continue through the area of the 1st and 2d Battalions, 2d Marines, tying in eventually with the right flank of the 8th Marines, which was to change its direction of attack from south to east. This latter change was actually only a formality inasmuch as Major Crowe's full attention since shortly after landing had been centered on the position just inland from the base of Burns-Philp Wharf, which was to the east. This main attack was to be reinforced in the zone of the 6th Marines by the 3d Battalion of that regiment, which was held in reserve just off Green Beach. Two battalions of the 8th Marines, the 2d and 3d, were to make the main effort on the left (north). The second objective of the day was to be the reduction of the pocket between RED Beaches 1 and 2. This attack was to be made by the 1st Battalion, 8th Marines. 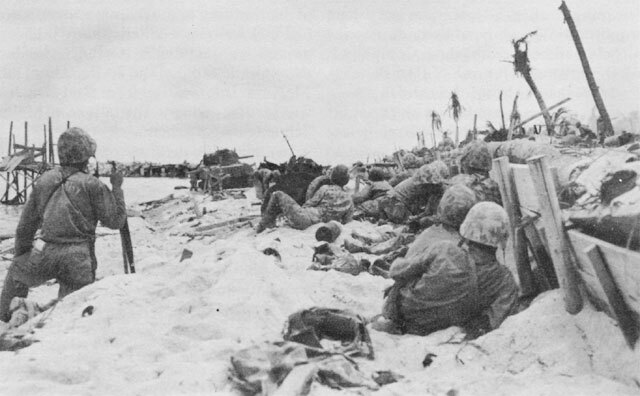 The battalion was to pivot on the beach, swing to the west, and move toward RED Beach 1 through the pocket, which would be contained on the opposite side by the 3d Battalion, 2d Marines. Japanese Bombproof Shelters, stubborn points of resistance, were reduced only after hard and prolonged fighting. Elsewhere on Betio gains had also been made during the day against heavier resistance and with less evident results. Company F, 8th Marines, aided by Company K of the same regiment and detachments of the 18th Marines (Engineers), finally succeeded in reducing the steel pillbox just inland from Burns-Philp Wharf, together with two strong supporting positions. One of the positions, a large blockhouse, was counterattacked by the Japanese shortly after it had been captured, but the attempt to retake it was broken up.85 It was the successful completion of this action during the morning that brought about the issuance of the new orders for the afternoon of the third day.86 Once the evidently strong enemy positions there had been reduced, the 8th Marines would be relieved while the relatively fresh battalions of the 6th Marines continued to the eastern tip of the island. 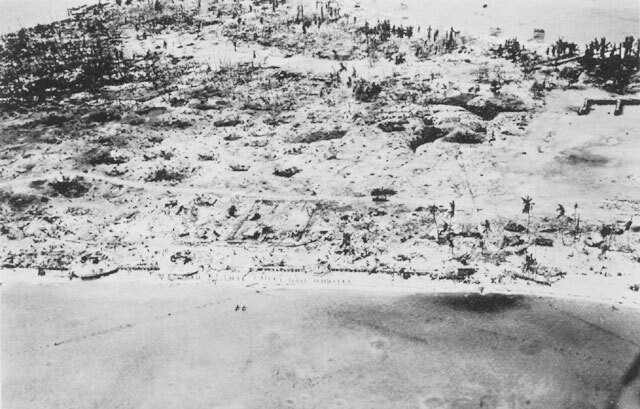 At 1330 the same afternoon, General Smith announced the end of organized resistance on Betio.99 Three jobs still remained, however, before the Gilberts operation could be considered completed: the rest of the islands of Tarawa Atoll had to be taken; Apamama Atoll must be captured; and Abaiang, Marakei, and Maiana Atolls occupied. This was a high price to pay for a few hundred acres of coral. Yet in the minds of most American military planners and strategists the cost of the capture of the Gilberts was justified both in the terms of the strategic gains realized and the tactical lessons learned. 1. It is impossible in this volume, which is primarily a history of Army operations, to give to the capture of Tarawa the detailed attention that the comparative size and nature of the operation would otherwise warrant. For a fully detailed and accurate account of the capture of Tarawa see Stockman, Tarawa This is the official Marine Corps account of the operation, published by the Historical Section, Division of Public Information, Headquarters, U.S. Marine Corps. 2. See above, p. 43. 3. See above, pp. 70-74. 4. Stockman, Tarawa, p. 9. 5. TF 53 Rpt of Tarawa Opns, 13 Dec 43, Incl A, p. 9. 8. TF 53 Rpt of Tarawa Opns, 13 Dec 43, Incl A, p. 30. 10. Ibid. 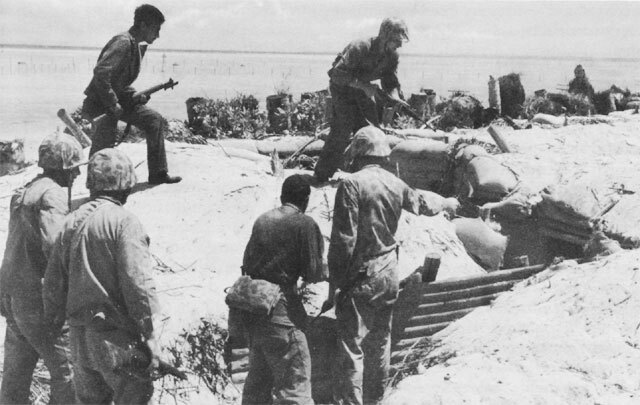 ; 2d Marine Div Special Action Rpt Tarawa, 13 Jan 44, pp. 4-5. Admiral Turner has offered as a possible explanation for the delay in the air strike the following: According to the original Air plan issued on 23 October, the dawn air strikes at both Makin and Tarawa were to begin at 0545 and end at 0615. Later, the Air representatives on the various naval staffs objected to such an early strike because their experience had demonstrated that shortly before sunrise airplane pilots, themselves high up in sunshine and thus good targets, could not distinguish their own individual targets hidden in the darkness below. Hence, on 5 November it was agreed by all the principal commanders present at the rehearsals of Task Force 52 in the Hawaiian area that the air strike should be postponed from 0545 until 0610. Admiral Pownall, in command of the carrier task force, was informed of this change of plan and in fact his pilots came in at Tarawa only three minutes late according to the revised schedule. Admiral Hill was at Efate when the revised plan was decided upon, and it is apparent that he was not aware of the change. Admiral Turner suggests one of three possibilities to explain the failure of co-ordination of the dawn strike at Tarawa: (a) either Turner's staff did not send the change in plan to Hill; or (b) due to a failure in fast mail or radio communications, Hill did not receive the change; or (c) having received the change, Hill's staff failed to act on it. (Ltr, Adm Turner to Gen Ward, 12 Feb 52, Incl 1, p. 12.) When interviewed, Admiral Hill was unable to throw further light on this subject (Interv, Philip A. Crowl with Vice Adm Harry W. Hill, 9 Apr 52), nor do the records consulted help to solve the mystery. At any rate, if Admiral Turner's conjecture is sound, the aviators of Task Force 50 must be absolved from blame in delivering their dawn strike later than was expected. 11. TF 53 Rpt of Tarawa Opns, 13 Dec 43, Incl A, p. 31. 12. Ibid. ; CINCPAC-CINCPOA Opns in POA, Nov 43, Annex E, p. 10. 13. USS Ringgold Action Rpt, 21 Oct 43-2 Dec 43, pp. 9-10. 15. CINCPAC-CINCPOA Opns in POA, Nov 43. Annex E, p. 11. 16. USS Pursuit Action Rpt, 6 Dec 43, p. 4. 17. TF 53 Rpt of Tarawa Opns, 13 Dec 43, Incl A, p. 32. 19. V Phib Corps GALVANIC Rpt, Incl F, Sec. II, p. 2. 20. TG 53.4 (Fire Support Group) Action Rpt, 17-22 Nov 43, p. 2. 21. TF 53 Rpt of Tarawa Opns, 13 Dec 43, Incl A, p. 48. 22. V Phib Corps GALVANIC Rpt, Incl F, Sec. II, p. 2. 23. TF 53 Rpt of Tarawa Opns, 13 Dec 43, Incl A, p. 48. 24. 2d Marine Regt Rpt of Opns on Betio Island, 20-24 Nov 43, Incl G, Account of Tarawa Opns by 3d Bn 2d Marines (hereafter cited as 3d Bn 2d Marine Action Rpt), p. 1. 29. 2d Marine Div D-3 Jnl, 19-20 Nov 43, p. 9. 31. 2d Marine Regt Unit Jnl Tarawa Opn, 20 Nov 43, p. 2. 32. 2d Marine Regt Rpt of Opns on Betio Island, 20-24 Nov 43, Incl F, Summary of Tarawa Opn by 2d Bn 2d Marines (hereafter cited as 2d Bn 2d Marines Action Rpt), p. 2. 35. 18th Marines Combat Rpt, Incl A, Rpt of Co A, 1st Bn 18th Marines, pp. 3-7; Stockman, Tarawa, p. 17. 36. 2d Marine Regt Rpt of Opns on Betio Island, 20-24 Nov 43, Incl H, Rpt of Tarawa Opns by 2d Bn 8th Marines (hereafter cited as 2d Bn 8th Marines Action Rpt), pp. 1-2. 37. Ibid., pp. 12; Stockman, Tarawa, pp. 16-17. 38. 2d Bn 2d Marines Action Rpt, pp. 2-4. 39. 2d Marine Regt Rpt of Opns on Betio Island, 20-24 Nov 43. Incl E, Rpt of Tarawa Opns by 1st Bn 2d Marines (hereafter cited as 1st Bn 2d Marines Action Rpt), p. 1. 40. Ibid., pp. 1, 2. 41. 2d Mar Div D-3 Jnl, 19-20 Nov 43, p. 9. 42. 3d Bn 8th Marines Special Action Rpt, 1 Dec 43, pp. 1-2. 43. 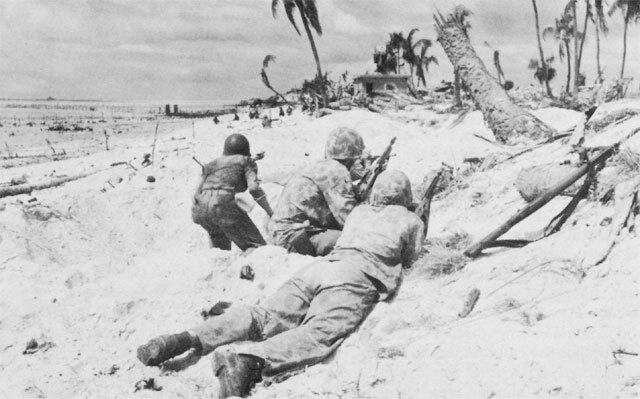 3d Bn 2d Marines Action Rpt; Stockman, Tarawa, p. 22. 44. 2d Marine Div D-3 Jnl, 19-20 Nov 43, p. 10. 45. Stockman, Tarawa, p. 22. 46. 2d Bn 8th Marines Action Rpt, pp. 2, 3. 47. 2d Bn 2d Marines Action Rpt, pp. 2ff. 48. TG 53.1 Rpt on Tarawa Opns, 1 Dec 43, p. 2; Stockman, Tarawa, pp. 25-26; Ltr, CG 2d Marine Div to CG V Phib Corps, 2 Jan 44, sub; Recommendations Based on Tarawa Opn, No. 3, Ship-to-Shore Supplies, Beach and Shore Parties, p. 2, A 7-17, 2d Mar Div/Recommendation Tarawa, Gilbert Area files, Hist Branch, G-3, Hq USMC. 49. 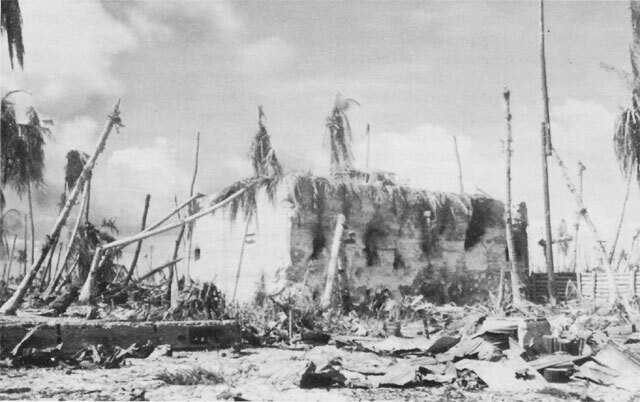 Stockman, Tarawa, pp. 26-27. 50. 2d Marine Div D-3 Jnl, 19-20 Nov 43, p. 17. 51. Stockman, Tarawa, pp. 25-26. 52. 2d Marine Div D-3 Jnl, 19-20 Nov 43, p. 24; Stockman. Tarawa, p. 26. 53. Stockman, Tarawa, p. 25. 54. 2d Marine Div D-3 Jnl, 19-20 Nov 43, p. 9. 56. 2d Marine Div D-3 Jnl, 20-21 Nov 43, p. 2. 57. Stockman, Tarawa, p. 24. 60. 2d Marine Div D-3 Jnl, 20-21 Nov 43, p. 2. 61. 2d Bn 8th Marines Action Rpt, p. 3. 62. 2d Marine Div D-3 Jnl, 20-21 Nov 43, pp. 1, 8-9. 63. 8th Marines Special Action Rpt, 1 Dec 43, p. 1; 1st Bn 8th Marines Combat Rpt, 28 Nov 43, p. 1. 64. 1st Bn 8th Marines Combat Rpt, 28 Nov 43, p. 1. 65. Stockman, Tarawa, pp. 37-38. 66. CINCPAC-CINCPOA Opns in POA, Nov 43, Annex E, p. 12; Stockman, Tarawa, pp. 36-37. 67. 2d Bn 8th Marines Action Rpt, pp. 3-4. 68. 1st Bn 2d Marines Action Rpt, p. 4. 69. 3d Bn 2d Marines Action Rpt, p. 2. 70. 2d Marine Div Special Action Rpt, p. 3. 71. 2d Marine Div D-3 Jnl, 20-21 Nov 43, p. 25. 72. Ibid., 19-20 Nov 43, p. 16. 73. 6th Marines Special Action Rpt, 20 Dec 43, p. 6. 74. Stockman, Tarawa, p. 40. 75. 6th Marines Special Action Rpt, 20 Dec 43, p. 6. 76. Stockman, Tarawa, p. 40. 77. Stockman, Tarawa, pp. 40-41. 78. 2d Marine Div D-3 Jnl, 21-22 Nov 43, p. 4. 79. 6th Marines Special Action Rpt, 20 Dec 43, p. 5. 80. Stockman, Tarawa, p. 43. 81. 2d Marine Div D-3 Jnl, 21-22 Nov 43, p. 6. 82. 6th Marines Special Action Rpt, 20 Dec 43, p. 6. 83. 2d Marine Div D-3 Jnl, 21-22 Nov 43, p. 15. 84. 1st Bn 6th Marines Special Action Rpt, 3 Dec 43, pp. 4-5. 85. 2d Bn 8th Marines Action Rpt, p. 4. 86. 2d Marine Div D-3 Jnl, 21-22 Nov 43. p. 17. 87. 1st Bn 8th Marines Combat Rpt, 28 Nov 43, p. 2. 90. 6th Marines Special Action Rpt, 20 Dec 43, p. 6. 91. 1st Bn 6th Marines Special Action Rpt, 3 Dec 43, p. 5. 92. Stockman, Tarawa, pp. 52-53. 93. 1st Bn 6th Marines Special Action Rpt, 3 Dec 43, p. 6. 94. Stockman, Tarawa, p. 54. 95. 1st Bn 6th Marines Special Action Rpt, 3 Dec 43, p. 6. 96. 6th Marines Special Action Rpt, 20 Dec 43, Narrative Rpt of Opns of Landing Team 3d Bn 6th Marines, pp. 3-4. 97. Stockman, Tarawa, p. 58. 98. 3d Bn 2d Marines Action Rpt, p. 3. 99. Stockman, Tarawa, p. 59. 100. 6th Marines Special Action Rpt, 20 Dec 43; Narrative Account of Opns of 2d Bn 6th Marines, 21-29 Nov 43, pp. 1-2. 101. Stockman. Tarawa, p. 65.